Departure time: 11.45 am (possible delays may be caused by logistical problems). At 11.45 am: meet our guide opposite the Academy Museum, Via Ricasoli 109, in front of the “Everything” - souvenir shop. The walking tour starts by visiting the Academy Museum, where among other works of Michelangelo, we will admire the magnificent David. 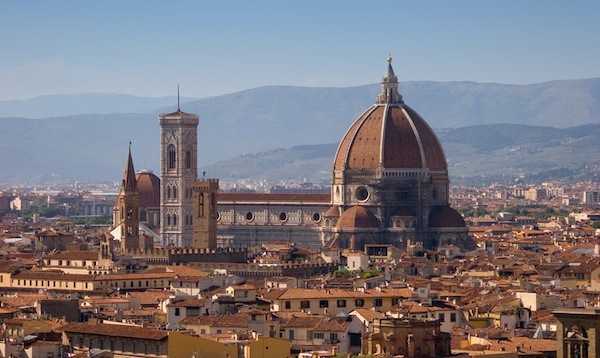 The walk continues with our guide through the historical streets of Renaissance Florence until we reach the religious centre of Florence to see the Cathedral of Santa Maria del Fiore, with Brunelleschi’s beautiful dome. Other treasures, the Baptistery and Giotto’s Bell Tower can be admired before walking along Via dei Calaziuoli, which leads to the political centre of the city: Piazza della Signoria. This is really the “heart” of Florence, an open museum with a collection of works of art from different historical periods. Our guide will tell you numerous interesting stories and little known facts about these beautiful buildings and statues. End of the walking tour.